Combine an amazing Thanksgiving dinner with the jaw-droppingly beautiful skyline of Manhattan on this enjoyable dinner cruise.. 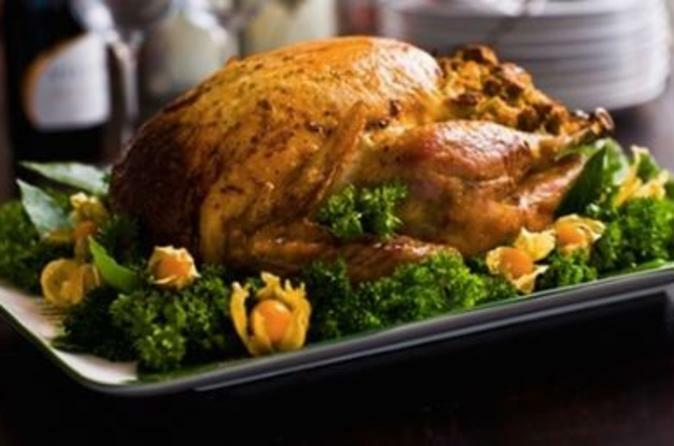 Munch on traditional and non-traditional Thanksgiving fare, take in the sites of the Big Apple's legendary landmarks -- from the Brooklyn Bridge to the Statue of Liberty to the Empire State Building -- and then take away great memories of an unforgettable day. Opt to upgrade to the Viator VIP option which includes a standard open bar and guaranteed window seating, only available on Viator. Make your way to Pier 81 on the west side of Manhattan to board your sleek, stylish boat for your New York Thanksgiving dinner cruise on Hudson’s brought to you by the team behind World Yacht at Pier 81. As you depart the pier, take in the New York City passing attractions as you cruise around the tip of Manhattan, up the East River to midtown, and then back around to the west side, taking in views of New York landmarks such as the Empire State Building, Chrysler Building and United Nations. You may upgrade to include wine pairings or an open bar. The wine is curated by the in-house sommelier and the wine discovery program will provide you the opportunity to taste a rotating selection of boutique wines, which will be suggested alongside food pairings. After dinner, spend the rest of your evening dancing or soaking up the dazzling sight of Manhattan lit up at night.